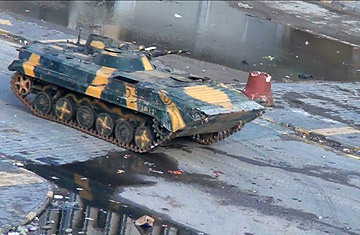 Video grab shows a Syrian tank driving through the city of Homs on December 26, 2011. Perhaps it was always going to be Mission: Impossible. The Arab League task force assigned to monitor Syrias compliance of a deal to end the countrys 10-month crisis is just a week into its month-long mission, but it has already been declared a failure by activists and politicians alike. On Tuesday morning, a gas pipeline near the embattled city of Homs apparently blew up as a result of an attack which both the regime and opposition blamed each other for as a plot to distract the monitors. It was an unfortunate turn in a mission that is already filled with self-doubt. Indeed, the Arab League has announced a meeting for this coming Saturday to discuss whether or not the monitors will be withdrawn. All this comes in the wake of a weekend declaration by the Arab Parliament, an 88-member body which advises the Arab League, its parent organization. In a strongly worded statement, Ali al-Salem al-Dekbas, the speaker of the Parliament, urged the immediate withdrawal of the small group of Arab League monitors in Syria, saying their presence was essentially buying President Bashar al-Assad time to continue killing his people. At least 150 protesters have been killed since the mission began in Syria on Dec. 26, according to some activists. Ammar Abdulhamid, a U.S.-based Syrian dissident who has been closely following events in his homeland through a vast network of sources, puts the figure much higher at 315. "For this to happen in the presence of Arab monitors has roused the anger of Arab people and negates the purpose of sending a fact-finding mission," Dekbas said. "This is giving the Syrian regime an Arab cover for continuing its inhumane actions under the eyes and ears of the Arab League." Although the Arab Parliament has historically been as toothless as its parent, it was the first body to recommend suspending Syria's membership in the Arab League, a decision later adopted in a sharp slap at Damascus, which has long prided itself as the self-declared heart of pan-Arab nationalism. Dekbas urged Arab League secretary general Nabil al-Araby to call for a meeting of Arab foreign ministers to adopt a resolution to pull the monitors out immediately. Speaking at the League's headquarters in Cairo on Monday, Nabil al-Araby, the organization's secretary general, said that the regime's snipers were still on the streets, although its heavy weapons had been withdrawn from cities and some 3,500 prisoners had been freed. The number of released detainees is significantly higher than the 755 the Syrian state news agency recently reported. The observer mission has been plagued by issues of credibility from the outset. The League's choice of Sudanese General Mohamed Ahmed Mustafa al-Dabi to head the group outraged rights activists, who questioned whether a senior figure from a regime with its own checkered human rights record was fit to assess Syria's actions. Dabi, a Sudanese military and intelligence officer, has been linked to alleged war crimes in Darfur by rights organizations. Syrian opposition groups called for his removal, something the Arab League is unlikely to do. Dabi stirred controversy by telling the media that he had seen "nothing frightening" during a previous trip to Homs, the Syrian city which has borne much of the brunt of Assad's wrath. On the weekend he did it again, bycontradicting videotaped comments by an unidentified, alleged observer in the southern city of Dara'a, where the uprising began in mid-March. The observer  dressed in a fluorescent orange vest bearing the Arab League's logo and speaking Arabic with what sounds like a North African accent  clearly says that his team saw snipers "with our own eyes." He called on the Syrian government to remove them within 24 hours otherwise "there will be other measures." The footage was filmed on Friday. At one point, a voice off-camera questions the observer's comments, prompting the man to angrily respond: "We saw them with our own eyes! Are you trying to tell me that I didn't see snipers? I can see for myself!" Dabi later told the BBC that the man was speaking hypothetically. "This man said that if he saw  by his own eyes  those snipers he will report immediately," Dabi told the BBC. "But he didn't see [snipers]." Dabi did not deny that the man on camera was an observer. It all reflects badly on the credibility of observer mission and the Arab League itself. It desperately wants an "Arab solution" to the Syrian crisis, but if the monitor mission has indeed failed, that may be unlikely. The mission is supposed cut through the propaganda of both regime and opposition in order to verify that Assad has withdrawn his military from the country's cities and towns, ceased violence, released all political detainees and begun earnest attempts to negotiate with the opposition. Instead, the death toll has continued to rise. Assad has played a furtive dance with the Arab League, goading it by repeatedly missing deadlines, and then making small gestures like releasing a few hundred detainees to indicate his goodwill and cooperation. The Syrian president only finally agreed to allow the monitors into the country after the Arab League threatened to take the case to the United Nations Security Council. Some observers say that the League's appointment of the Sudanese general (Sudan had sided with Syria on some League votes to censure Damascus), and the watering down of the mission's numbers were to appease Syria and indicate its non-bias. The mission was supposed to comprise 500 monitors, but that figure was whittled down to about 150. Less than 100 are on the ground in Syria. No one wants what will be the likely consequence of the mission's failure: some form of more rigorous intervention, at the diplomatic and/or military level. Syria is not Libya, Egypt, Tunisia or even Yemen or Bahrain. It is much more dangerous and, in many ways, important than all the rest. The conflict, which is becoming increasingly sectarian, risks spilling over into fragile neighboring states like Lebanon and Iraq  and even to Israel, which shares a border with Syria.